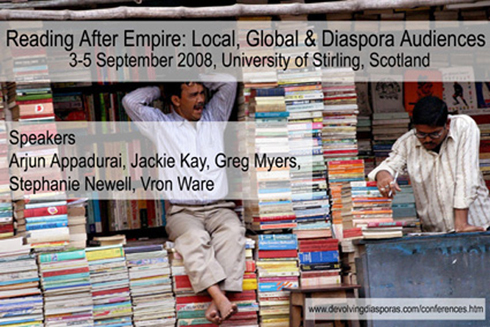 ‘Reading After Empire’ was an international conference hosted by the University of Stirling, Scotland, in September 2008. The focus of this three-day event was the central but neglected role of audiences (readers, viewers and listeners) in colonial, postcolonial and diasporic contexts. Attended by over 80 delegates from around the world, the conference generated a wide range of papers on readers and reading acts in India, Africa, the Caribbean, Europe and North America. Speakers contributed both empirical and theoretical accounts using reading in a variety of senses: as consumption, as hermeneutics, as exoticism, as translation. Topics and discussions were equally diverse, ranging historically from the Roman Empire to 9/11; from the specific (CLR James reading Vanity Fair; Caryl Phillips reading Naipaul) to the general (the ethics of reading in postcolonial contexts). What they all shared was an interest in exploring the politics, and the pleasures, of reception within a field that has too often overlooked or distrusted the reader. Perhaps the diversity of papers the conference attracted was a symptom of this neglect, and the new and necessarily tentative approaches required in the recovery of an under explored area. Either way, it was a diversity encouraged by the conference organizers who deliberately chose keynote speakers from a variety of disciplinary backgrounds to bring the widest possible expertise to bear on the postcolonial politics of reception. Journalist and sociologist Vron Ware explored how ‘cultural relations’ are handled through reading and translation by exploring the current interest in Arabic literature in an age of global telecommunications. The literary critic Stephanie Newell pursued the complex articulations between reading, newspapers and print culture in colonial West Africa. Linguist Greg Myers looked in forensic detail at the conversational turns of reading groups, focusing on a broadcast discussion of Toni Morrison’s Beloved. Cultural critic Kobena Mercer looked at ‘the problem of the visual’ for both postcolonial and reception studies, using the British reception of African American painter Robert Scott Duncanson as a case study. In addition to these keynotes, the conference hosted a one hour conversation between anthropologist Arjun Appadurai and one of the ‘fathers’ of audience studies, David Morley. This conversation, which (perhaps appropriately in terms of the conference theme!) took place via a video link between New York and Stirling, was in turn opened up to the audience. The ‘Reading After Empire’ conference emerges out of a three year AHRC-funded ‘Devolving Diasporas’ project, looking at how readers in the UK, Africa, India, the Caribbean, and Canada make sense of the same texts both locally and transnationally. The aim of the conference was to stimulate fresh research into reception that might help inform this study, and the organizers are currently in conversation with interested publishers and journals to secure the publication of key papers.